Two Auckland architecture and design firms collaborate on an inventive approach to urban cycling infrastructure. 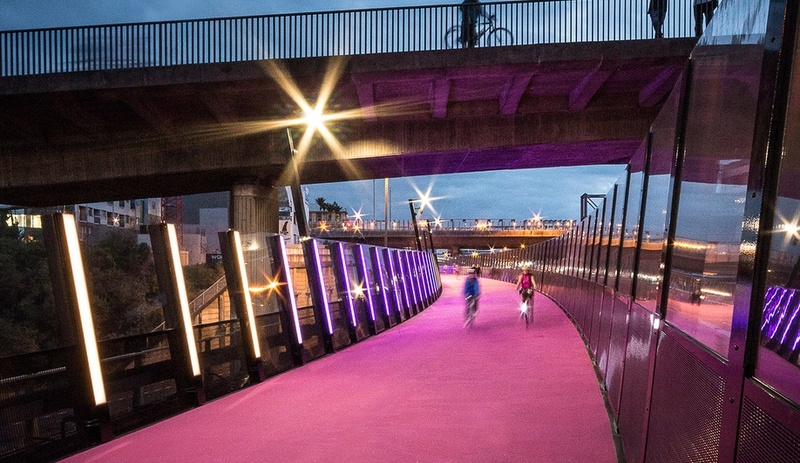 An unused stretch of highway in downtown Auckland, New Zealand, has been reimagined as a vibrant pink cycleway that turns infrastructure into public art. When a study identified a closed inner Auckland off-ramp as a potential cycling route, government groups tapped two local architecture and design firms – Monk Mackenzie and LandLAB – to transform the roadway into a hybrid space that would transport both cyclists and pedestrians. 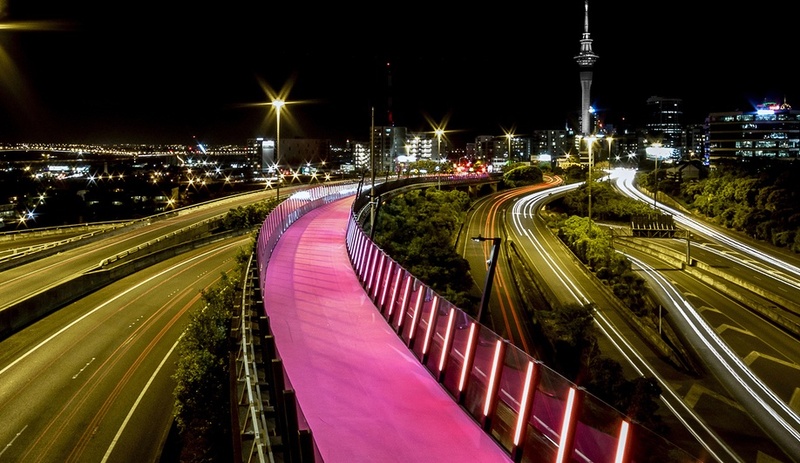 In response, the two firms delivered a 600-metre-long path, sheathed in magenta and lined with hundreds of LED lights, that they call Lightpath, or Te Ara I Whiti – Maori for “path of light.” It features a two-way on-road lane, separated by raised buffer islands, reserved for cyclists; and a wider path dotted with benches, open to both pedestrians and bikers. 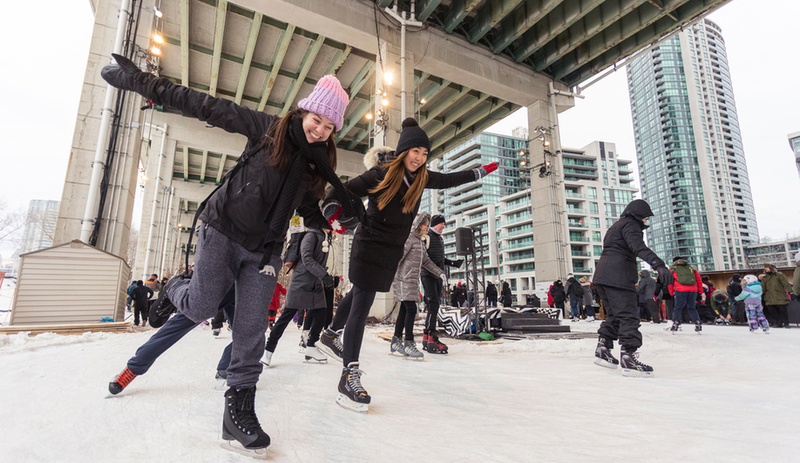 Lightpath opened in December and was recently shortlisted for a 2016 World Architecture Festival award. The designers covered the highway asphalt with a non-slip, vibrant pink resin made with recycled glass, to boldly differentiate the cycleway from the busy highways that surround it, but also to inject a dash of whimsy. 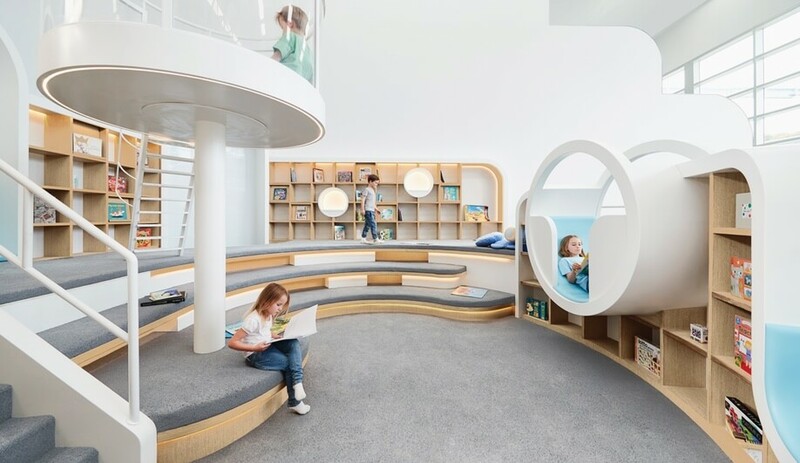 LandLAB says the hue, named telemagenta, is a playful nod to the bustling nightlife of the adjacent Karangahape Road neighbourhood. 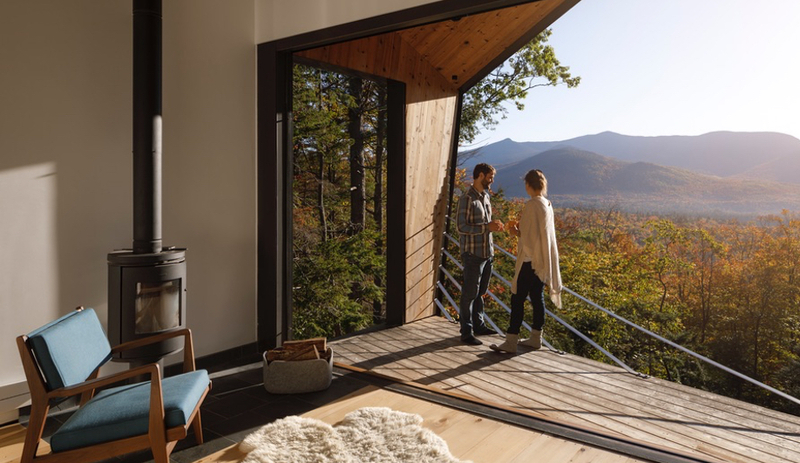 The resin aggregate, a New Zealand-made product called EverGreen, is anti-skid in all weather conditions and has a glitter effect in sunlight. 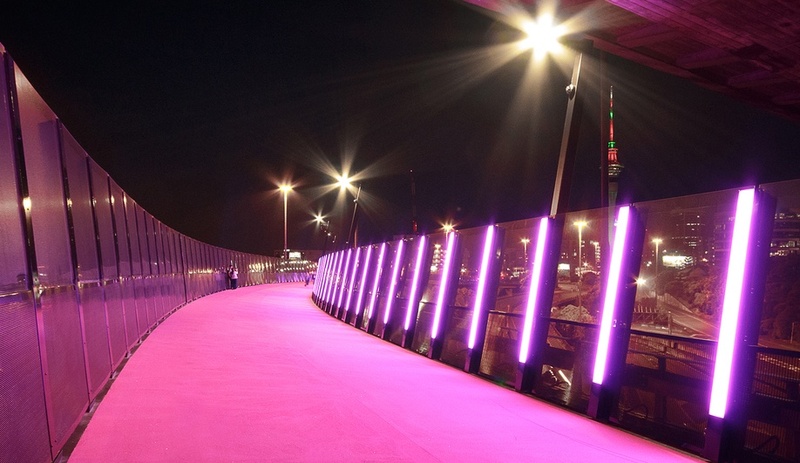 To provide ample lighting for dusk and evening cyclists, the designers installed 300 individual LED light poles along the east spine of the pink cycleway. 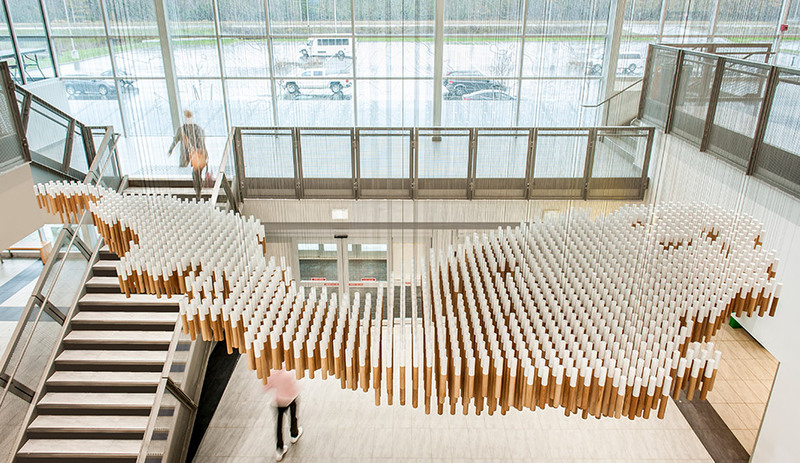 Controlled by sensors, the lights respond to the patterns and undulations of movement on the path, creating an interactive light sculpture. The team collaborated with Maori artist Katz Maihi to ensure that the personality of Lightpath was distinctly “Kiwi.” For the northern end of the cycleway, Maihi created a 27-metre-long surface artwork that was only partially coated with the same pink resin to transition the roadway back to asphalt. Other original works by Maihi were engraved on aluminum plates and installed on the western edge of the cycleway. 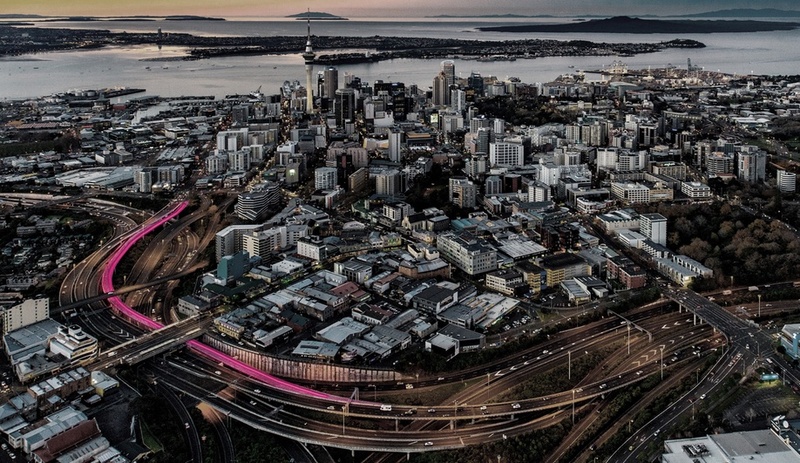 It was conceived that Lightpath would play a critical role in Auckland’s cycling infrastructure, connecting existing routes and linking neighbourhoods. Early ridership numbers prove it to be a rousing success; by the end of March, only three months after the shocking-pink cycleway opened, more than 100,000 rides had been taken.